Specialty Deluxe Pizza The traditional pizza is made with fresh dough using the same recipe over the years and then baked golden crisp in the stone oven. We make Pizza with spices and the perfect amount of cheese and sauce. Our sweet sauce is delicious. The pizza looks amazing and the smells are mouthwatering. 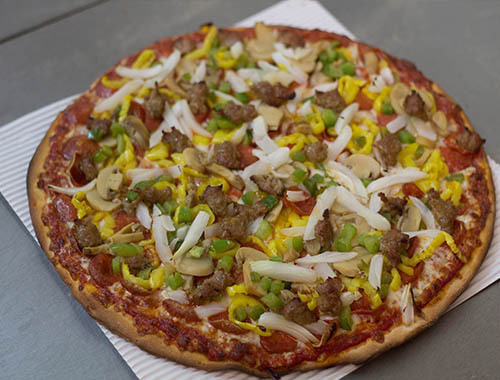 Toppings: Pep, Mushrooms, Banana Peppers, Onions, Green Pepper, and Sausage.